YUMA, Ariz. 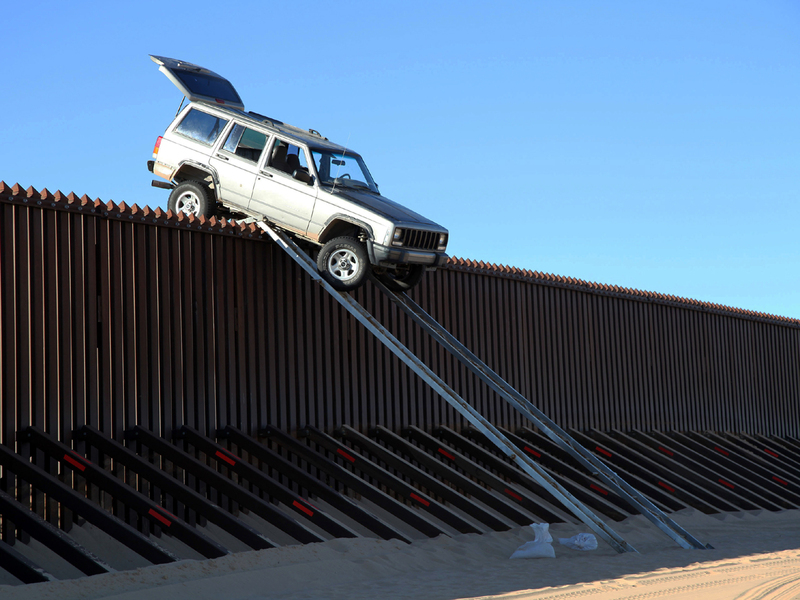 Suspected smugglers who tried to use ramps to drive an SUV over a 14-foot-tall border fence had to abandon their plan when the Jeep became stuck on top of the barrier, authorities said Wednesday. Agents patrolling the U.S.-Mexico border near the Imperial Sand Dunes in California's southeast corner spotted the Jeep Cherokee teetering atop the fence early Tuesday, Border Patrol spokesman Spencer Tippets said. The vehicle was perched about five miles west of the Colorado River and the Arizona state line. The Jeep was spotted just after midnight, CBS Yuma affiliate KSWT-TV reports. Two smugglers on the Mexican side of the border were trying to free the Jeep when the agents approached, Tippets said. They ran further into Mexico and escaped. The Jeep was empty, but agents said it was probably filled with contraband like bales of marijuana before it got high-centered atop the fence. The smugglers had built ramps to drive up and over the fence, something that has been tried at least once before. In April 2011, agents found a truck that had ramps built onto it and had driven up to the border fence. A pickup had driven up and over the fence, but it was spotted and its occupants were captured, Tippets said. The agency's Yuma sector has seen a 95 percent reduction in human smuggling in recent years, freeing up agents to focus on drug smugglers. "Because of how successful we are we don't have all the clutter like we had in years past," Tippets said. "Now that all the clutter is gone, we're able to focus on things that are bigger threats." The terrain in western Arizona and eastern California has little vegetation and is much less rugged than the land in southeastern Arizona, so smugglers have a harder time making it into the U.S. without being spotted.